Logos Bible Software is offering the Pulpit Pages material through their pre-publication campaign. Through this approach, Logos offers the title at a reduced price prior to the final publication. This confirms enough interest in a particular title to cover the cost of publication and marketing. Once there is enough interest to follow through with the title, it will be published and made available. If you are a Logos user, and are interested in the Pulpit Pages title, go ahead a pre-order. You will save money through the reduced price prior to release. Once the title receives the pre-orders necessary for publication, Logos will move forward with publication and make the title available for download. If you are interested, click here. We know that Jesus called us to go forth and make disciples. I don't know of anyone who would argue that. Clearly that is His mandate and it must be our mission. But honestly, how are we doing fulfilling the Great Commission our Lord left us. I fear, in the average Baptist church, it has become the Great Omission. We like to talk about our need to make disciples, and we even pray for opportunities to witness and influence others, but we are failing miserably. We must get about the business of being disciples of Christ and making disciples for Him. That is certainly sobering, but true. The question is: what do we plan to do about it? Are we going to continue to "do church" as usual, or are we going to follow the command of Jesus and make disciples? I am happy to announce that Pulpit Pages is now available as an add on Bible study module through WORDsearch, a division of LifeWay Resources Inc. If you are a WORDsearch user and would like to add Pulpit Pages to your digital library, you can find the Bible study module here. As I shared with you earlier, I will continue to post material to the website as I prepare and preach messages at Fellowship. The material will remain available free on the website. This is just another door the Lord has opened for His Word to be shared and preached. I desire your prayers as I continue to serve the Lord in the work He has called me to. 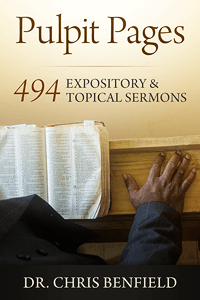 I am pleased to announce the release of Pulpit Pages as an add on module for PC Study Bible. I have been working with the fine folks at Biblesoft Inc. for a few months now and the software was released yesterday. If you are a Biblesoft user, this software will work with what you already have. Here is the link if you are interested. I am humbled at the way God has used this online ministry over the years and I am truly thankful for the doors He continues to open. I will continue to post material here as I prepare and preach messages at Fellowship. As always, the material will be free for you to use as the Lord leads. If the site has been a blessing or help to you, please take a moment and send an email. I always enjoy hearing from you. I am currently working with another publisher as well. I will let you know when the material is released through them. Please keep us in your prayers as we continue to seek the Lord and serve Him. The past couple weeks have been much busier than normal for me. Several families within our congregation have faced great trials and adversity. I have spent much time in the emergency room, the surgical waiting area, by the bedside of those within the hospital, at the funeral home, and even the graveside. These have been difficult and tiring days, both physically and emotionally. I have looked into the eyes of dear families and witnessed the tears, anxiety, and hurt. I have prayed with them and sought to offer what comfort I could. One would think these were weeks that required much more than they gave, but I have found the opposite to be true. As I spent time with the wonderful families of Fellowship, I witnessed a quiet strength, a determined faith, and a continual offering of praise unto the Lord. These weeks have driven us to our knees in prayer, but they have also allowed us to be lifted up by the abundant grace of our Lord. They were tiring and demanding days physically and emotionally, and yet they have been wonderful days spiritually. I have noticed over the years that folks tend to expect the pastor to bring comfort to the hurting and offer strength for the weary. I hope I have been able, in some small way to do that, but I have genuinely received more than I have given lately. Spending time with our church family, in the worst of circumstances, I have experienced the best within their lives. I am honored and blessed to be able to serve the fine people of Fellowship. I am thankful for the opportunity to share in their lives. The busyness hasn't ended, but the blessings continue to flow. It is easy to allow circumstances to hinder our joy, but there is always reason to rejoice! In the happy moments, praise God. In the difficult moments, seek God. In the quiet moments, trust God. In every moment, thank God. As difficult as our days may be, we are truly blessed. We can always find God's blessing, even in the midst of trials!! The new year always serves as a time for reflection on the past and a challenge for the future. Our HOPE Ministry team met this week and the focus of our time together was church growth. As we reflected on the past year, there was no doubt God had been good to us, but we also sensed the need for a greater outreach. I am certainly thankful for all the Lord has done for us, but I am convinced He desires to do much more among us. Church growth is a hot topic these days. There is an abundance of books, literature, and articles on the subject. Many seem to convey they have found the latest and greatest approach for church growth. I will agree that much of what I have read and considered is thought provoking. I truly believe the majority of writers are earnest in their desire for church growth and are genuinely sincere in their approach. The problem is, there seems to be no real consensus. I know that churches are different, just like the communities in which they reside. What works in some instances, may or may not work in others. However, shouldn't there be an approach that would work across the board, regardless of where you are or the culture you are trying to reach? I am convinced there is, but it won't necessarily be found in the latest church growth book or article. We know the church is not our buildings or facilities; it is the body of Christ, the believers. Surely since our Lord built and ordained the church, He would have something beneficial to say concerning church outreach and growth. He does in fact; we need not look any further than the book of Acts. I am certain we need to consider the biblical model if we are to experience church growth. 1. An Emphasis on the Word - They continued steadfastly in the apostle's doctrine. Simply they taught and preached the Word. This was the priority. They focused on the Word. It seems as if the Word is no longer the emphasis in many approaches today. If the Word is not emphasized, there will be no spiritual depth, and little lasting growth. Other means may appeal to the desires people have, but they will never create lasting, effective growth. 2. Worship - They also continued steadfastly in breaking of bread. This speaks of their observance of the Lord's Supper. They remained close the cross and the empty tomb. They worshiped the Lord for the sacrifice He made in order to secure salvation and rejoiced in the hope afforded believers by His resurrection. Genuine worship cannot be ignored if we are to experience church growth. I know each church sets aside time every Sunday morning for the "worship service," but we must ensure our worship is genuine. Worship must include a time when we are overwhelmed by the mercy and grace of our Lord. We don't have to partake of the Lord's Supper every service, but we must come with a desire for and commitment to worship! We must exalt the Lord and make much of Him rather than our focus being placed upon those who participate in the service, or the physical needs of others. 3. Fellowship - They also continued steadfastly in fellowship. They genuinely loved each other and enjoyed each other's company. They looked forward to gathering with those of like faith on Sunday morning. Fellowship involves many aspects, but one of the greatest is a sense of belonging. Individuals connect with one another because of their shared position in Christ. There is a sense of gratitude and concern for one another. Fellowship isn't immediate, it must be worked on and worked at. People may gather together each Sunday, but simply coming together doesn't necessarily create fellowship. It has the idea of "participation, literally to share in." It allows people to feel connected. It allows them to feel as if they genuinely belong. Creating an atmosphere of fellowship is essential to church growth. I read somewhere recently that folks who visit our churches will make up their minds within the first ten minutes of their arrival whether they will return or not. Church growth will never happen if folks never come back. Now, think about the initial ten minutes after arrival. They haven't heard the choir sing. They haven't heard the preacher preach. They likely haven't even heard a prayer prayed. They have had an opportunity to consider the facilities and whether they look appealing. They have had an opportunity to be greeted and welcomed into the service or be completely ignored. Creating an atmosphere of fellowship is essential for first time visitors especially. 4. Prayers - This one should go without saying, but we need to be reminded. They continued steadfastly in prayers. They prayed unto the Lord. They knew the church was totally dependent on Him. They couldn't imagine gathering without having taken time to pray prior to their arrival. They were continually praying for the church and the work they were called to do. If we are to experience church growth, we must be committed to prayer. A brief prayer on Saturday night or Sunday morning will not suffice. We must live in an attitude of prayer daily! If our churches are to grow, God will be the One to give the increase. Let us seek Him in prayer for such an increase! The people had a simple plan for church growth, but it was very effective. Acts 2:46-47 - And they, continuing daily with one accord in the temple, and breaking bread from house to house, did eat their meat with gladness and singleness of heart,  Praising God, and having favour with all the people. And the Lord added to the church daily such as should be saved. God blessed their faithfulness. This approach may not resemble many of the approaches being promoted today, but it is guaranteed success. This biblical approach will work. May we be faithful to the New Testament model for church growth! I want to take a moment to apologize for the mess this blog was in without me being aware. I have noticed a lot of interest in the post concerning "Having a Mind to Work" and I thought I would add a link to the page where that series of messages is located. As I was doing that I noticed many of the archived entries looked as if portions of their text were missing. I set to work hoping to fix the problem, thinking there must've been a technical error. It turns out that the changes in format I made about a year ago also changed the font color from what existed on the original post. The text was still there, but it was so faint it couldn't be read. I entirely deleted a few posts before I figured out what was actually wrong. If you have visited the blog page previously and noticed what appeared to be a random mess on some of the pages, I hope you will forgive my oversight. I earnestly desire this site to be a blessing to those who stop by and read it. I am aware there are countless other sites you could be viewing, and I want to ensure the best experience possible while you are visiting us. Also, if you visit Pulpit Pages and notice something that appears to be out of order, please take a moment to email me and bring it to my attention. I post the content on a publishing site and am not on the actual website that often. Therefore it is possible for me to overlook errors that appear after the content is published. I hope to be a bit more regular in posting. I am not making any promises, but I do desire to add more content on the blog in the coming year. I hope you have a blessed and prosperous year in your endeavors for our Lord. Many refer to this season as the most wonderful time of the year. It certainly is an exciting time. We will celebrate Christmas in a few days. For the Christian, our minds are filled with images of that faithful night when Christ was born. We imagine Christ being lovingly wrapped in swaddling clothes and laid in a manger. We consider the angelic host appearing to the shepherds in the field and their obedient worship that followed. We consider the wise men coming from afar, following the star that guided them precisely to the home of the young child, Jesus. We celebrate the birth of Christ, keenly aware that as we celebrate His birth, we are the recipients of the gift. Christmas is indeed a wonderful time of year, but we must not leave Christ in the manger. He did come as a humble babe, but He grew into a man. The birth of Christ had purpose. It was a miraculous event, but there was much more to come. John the Baptist introduced Jesus as the Lamb of God who would take away the sins of the world. We know that Jesus came to provide redemption for fallen man. He came to offer Himself the sacrificial atonement for humanity. The crucifixion brings great emotion and praise from the hearts of believers. We know it was there He fulfilled the redeeming work He came to accomplish. However, we must not leave Jesus on the cross. Had He just been born, although from a virgin womb, and merely died upon the cross, there would've been little difference from others who lived and died. As we consider the wonder of Christmas, we must also consider the empty tomb. Had there been no resurrection, our hope would be in vain. In coming forth alive from the grave, Christ emerged victorious over sin, death, and hell. His resurrection sets Him apart from all others. We will celebrate the birth of our Savior this week, and as we do, may we also celebrate the risen Lord. The Lord is Coming Again! As of late I have been engaged in several conversations concerning the return of our Lord. The second coming of Christ is looked at from several viewpoints and has been the subject of much debate. We may not like to admit it, but there is much about His coming that remains a mystery to us. I have never talked with someone who felt as if they fully comprehended all that is involved with that glorious event. Most Baptist, including myself, believe the return of Christ will involve two separate and yet very distinct events. The first event will be the coming of Christ in the air to rapture His church, 1 Thessalonians 4:13-18; 1 Corinthians 15:51-58. At this time the Lord will not return to the earth, but meet the church in the air. The second event will be the literal, bodily return of Christ to the earth to establish His earthly kingdom where He will rule and reign for a thousand years, often referred to as the Millennial Reign, Revelation 19-20. I hold the view that the church will be raptured prior to the Great Tribulation and the Millennial Reign will begin at the conclusion of the seven years of tribulation. This is where the debate typically centers. The evidence is clear in the Scriptures that each of these events will happen, but many can't agree in regard to the specific timing of each event. With these thoughts in mind, I read some interesting and stirring thoughts from Dr. Reg Dunlap, President -Bible Conference Speaker at Evangelism For Christ Association. Take a moment to consider his thoughts. Without being conceitedly dogmatic, ever realizing that all views regarding the Lord's coming have their problems of interpretation, nevertheless, it seems to me that the premillennial, pretribulational view most advantageously provides the book of Revelation with some chronological order of development. Not only that, but it completely fulfills the unconditional promise that God made to Abraham in which he and his descendants would rule in a world-wide Kingdom at which time Christ would reign upon the throne of David. So I approach the Bible as a Premillennialist - Christ will come for His Church before the millennium - and a Pretribulationist - Christ will come for His Church before the Tribulation period. But whatever system you hold regarding the Lord's coming, remember this: The most important thing is not HOW Christ is coming but the FACT that He is coming. We are not looking for SOMETHING to happen, but for SOMEONE to come. So let us get our eyes OFF the SIGNS and put them ON the SON. (Dr. Reg Dunlap; Check out Sermonseeker.com for some dynamic expository sermons). I have to agree with Dr. Dunlap. Although there is much we don't understand, one thing is absolutely certain: The Lord IS coming again. Regardless of your personal view of when these events will unfold, we agree they will happen. I rejoice to know that I have been born again in Christ, placed into the family of God, and made a partaker of that glorious, eternal inheritance. Christ is coming again. If He were to come today, do you know for certain you are ready to meet Him?